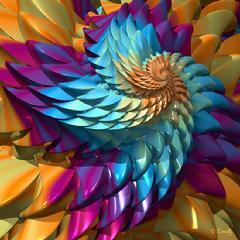 A 3d Fractal that is more like a flower than some flowers. A pretty bouquet of flowers, simple yet elegant." And why, you might ask, are we talking about Ed Kinnally today, beyond the fact that we love his artwork? Because, he's our latest addition to our Raw Talent list, a selection of artists and photographers who, in our unashamedly personal opinion, are creating extraordinary work in their own respective genres." Edward Kinnally has created two very sensual, mysterious, digital images. "Red Planet" is a surreal landscape, full of vibrant color and beautiful curves. 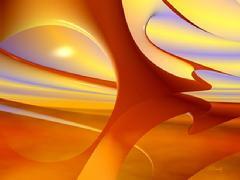 "Sinuosity" is another example of how Edward used smooth curves as a focal point. But this time, to contrast a more geometric background. Great composition, great colours, great pattern, great everything. It's a beauty. Contest award winner; 'First Place' for "Dragon Skin"! 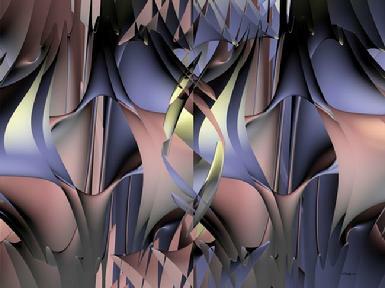 This piece won the 'Geometric and Fractal Art' contest at 'A Singular Creation'. The winner was chosen from 165 entries. This win gives the artist top honors in two back-to-back submissions in two different venues. 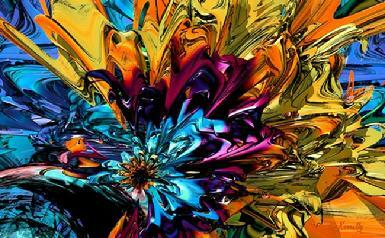 "Some optical illusions / abstracts are fabulously marvelous and breathtaking. This piece is one of them. Edward Kinnally has worked hard on this art to make a spectacular organic painting that speaks to people. 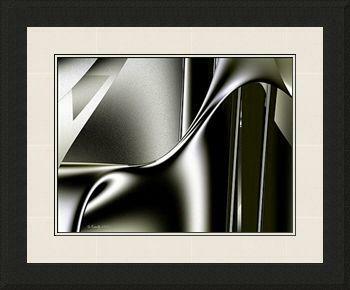 This artwork has wonderful color harmony, is excitingly energetic and full of sharp edges but it is also full of soft rounded flowing curves of color - similar in thought to me of music flowing through the air � he has taken these contrasts and blended them together perfectly. I have vision issues so I probably would not be able to see the optical illusions but he has made sure that for us all � the art stands alone without having to see the hidden illusion to be awestruck at his mastery of form, color and harmony." Blue Ribbon award winner; "Best of Show"! This piece won the Heritage Museum's 2008 'Annual Fine Art Show'; a juried art show with over 120 artworks. The prize winning art was framed as shown.
" Gooey Chocolate Caramel Nougat #1 "
1. The quality or condition of being sinuous. 2. A bending or curving shape or movement. 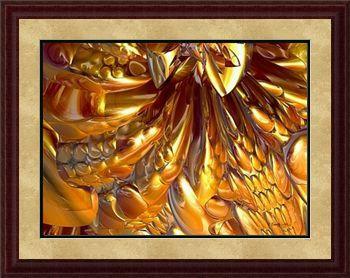 "Three-dimensional art, when rendered well, can be quite breathtaking. This work, by E.L. Kinnally, is rendered well - better than well. The gentle curves are contrasted by the few sharp angles. 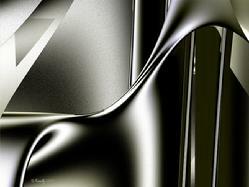 The shine that follows the curves is executed perfectly. I love the texture on the back surfaces. It�s a quite relaxing bit of art; perfect for a study, a library or an office. The choice of frame and mat are perfect; I wouldn�t change a thing. 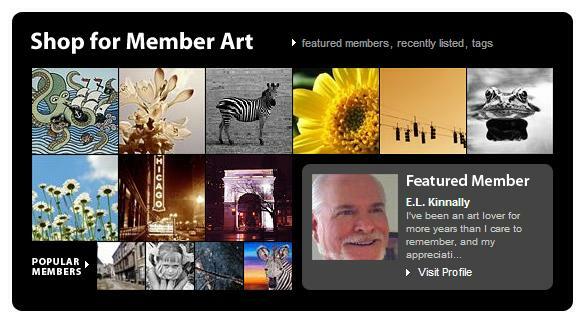 Like all art at Imagekind, they may be changed by the buyer, however. 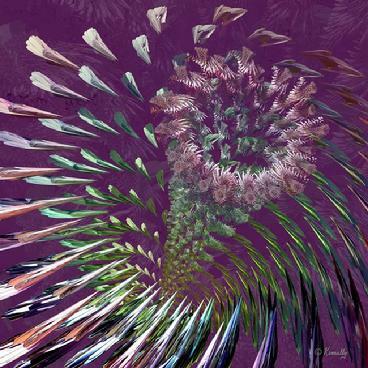 Click on through to learn more and to read Mr. Kinnally�s fine description of his art." A significant achievement considering the number of artists!